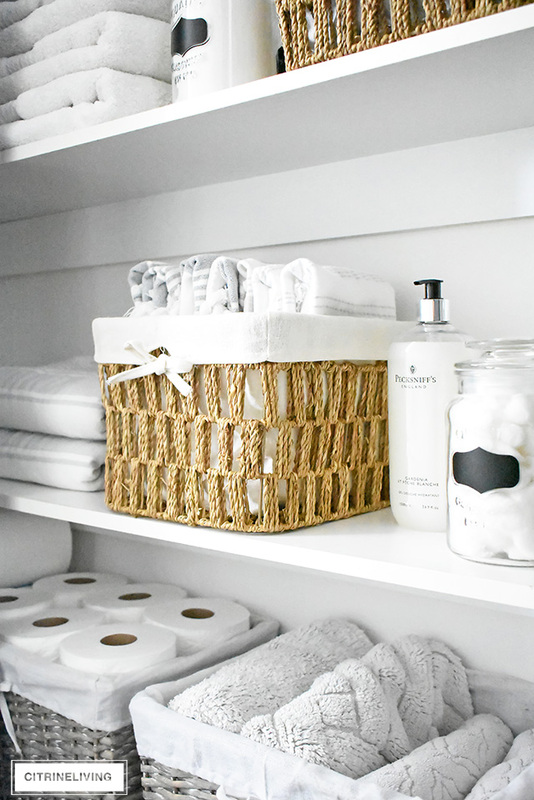 I am so excited to share our organized linen closet reveal with you today! It is probably the most gratifying before and after I’ve ever tackled. Well, when it comes to organizing that is. 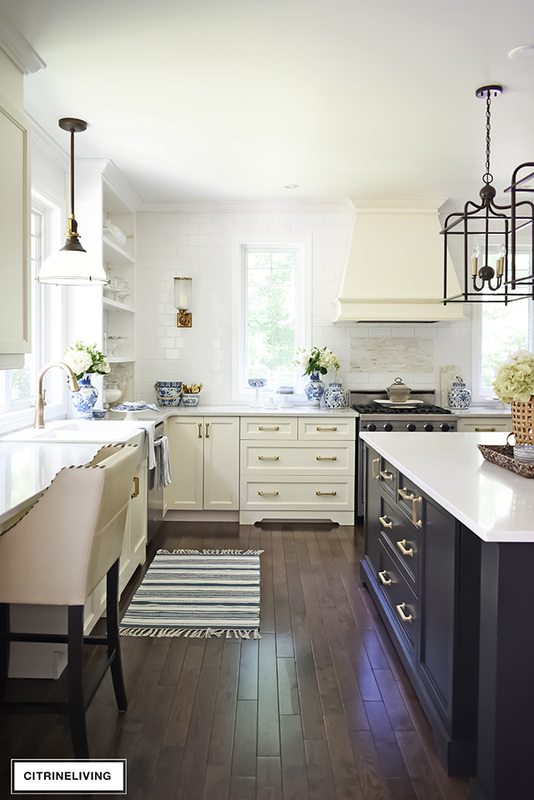 Last year, when I revealed our pantry makeover (see it here), I felt the exact same way. I still love it to this day! It cost very little and functions perfectly for us. What I love about today’s reveal, is that it’s incredibly functional and so beautiful you are going to love this too, I promise. I’m thrilled with the results and can’t wait for you to see. 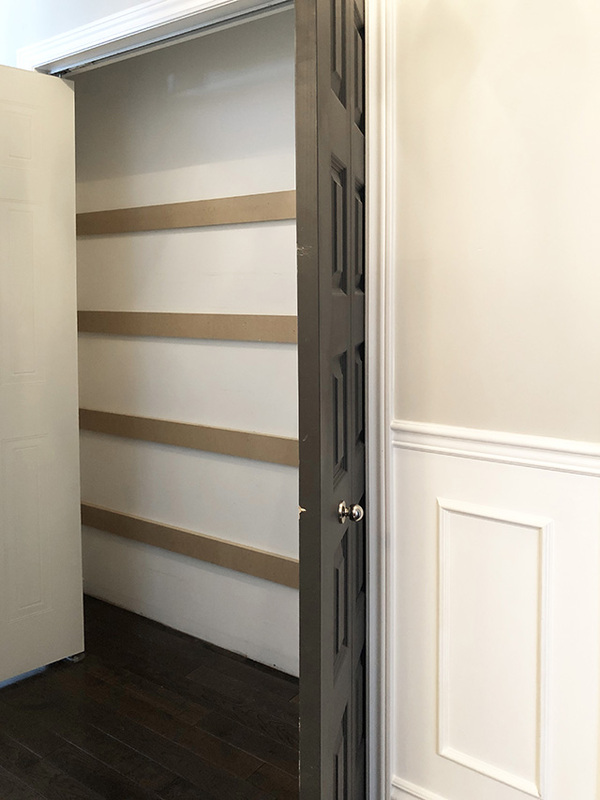 I shared my plans for this closet as well as a few other current projects last week, if you missed that post, you might want to read it here – my kitchen drawers are getting a mini overhaul too, a quick fix that I’m excited to share soon as well. 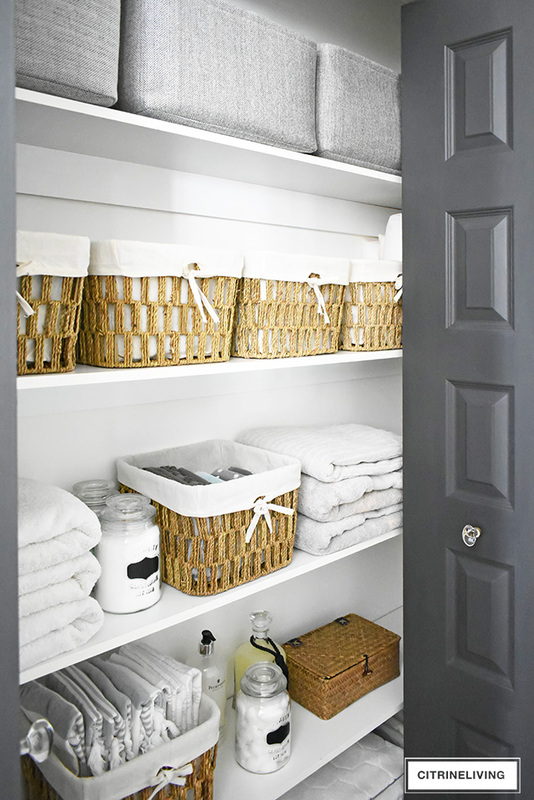 That will be another day, today is all about our beautiful, clean, bright and airy, organized linen closet. Come and take a look. 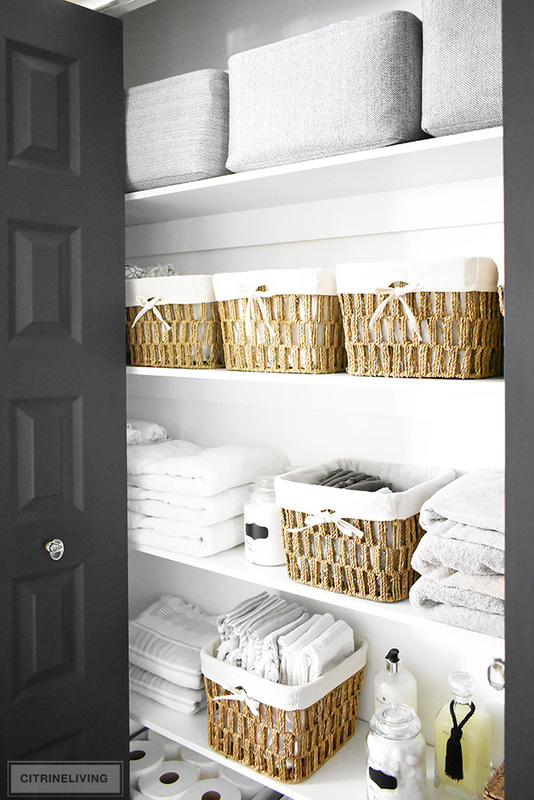 OUR ORGANIZED LINEN CLOSET MAKEOVER REVEAL! 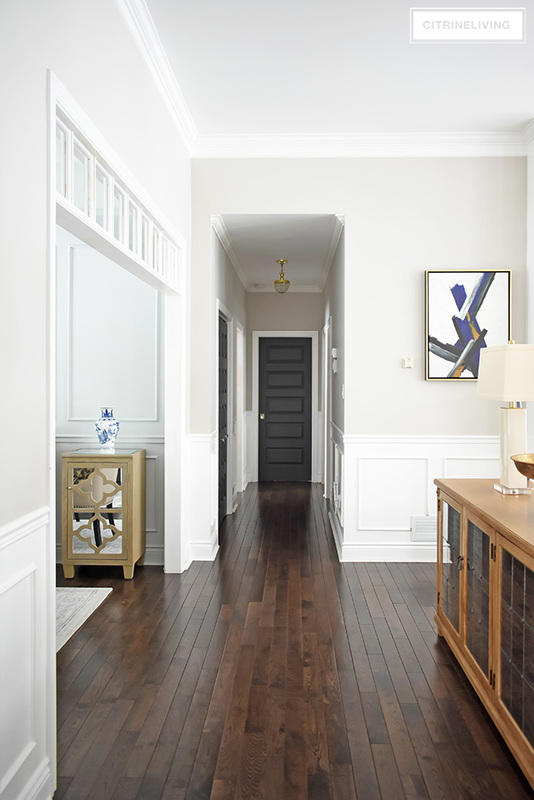 We have a very narrow, dark hallway, with no natural light whatsoever, so it was very important to me to bring a light, airy and open feeling to this space. We recently updated all of our door handles throughout our home, and we added some beautiful matching glass knobs on these doors as well. All of our new hardware, including our front door is from Emtek – they are exquisite. You can see how narrow this space is, and luckily, our linen closet is nice and wide. Unfortunately, it’s very shallow, so it can be tricky to store things in here. 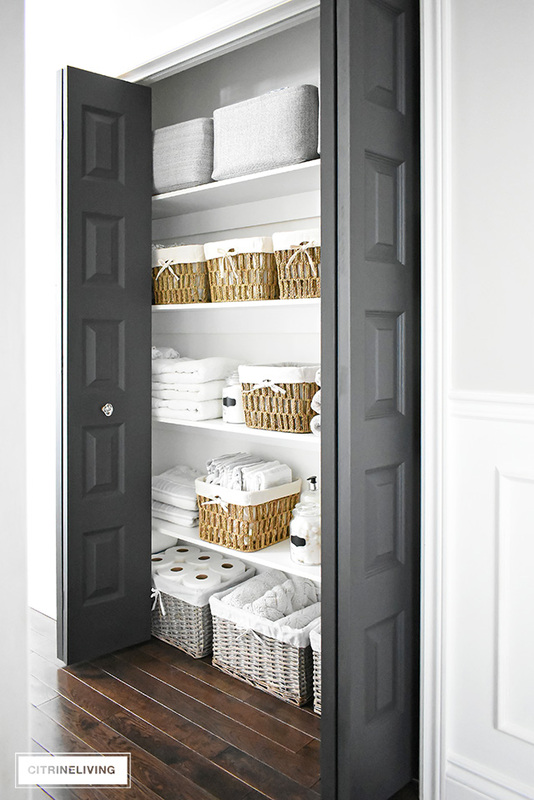 Clever storage and and careful editing were a must for this linen closet. FIRST, LET’S SEE THE BEFORE! I took everything out of the closet, including the shelving so I could give it a fresh, bright coat of paint, and also to be able to see what I actually had in here. I can’t believe the difference the white paint makes. It’s amazing, really. Those brown, MDF shelf brackets added so much visual noise. Now that I had a fresh clean palette to work with, I could see the light at the end of the tunnel. I also gave the doors a few paint touch ups as well, they really needed it! 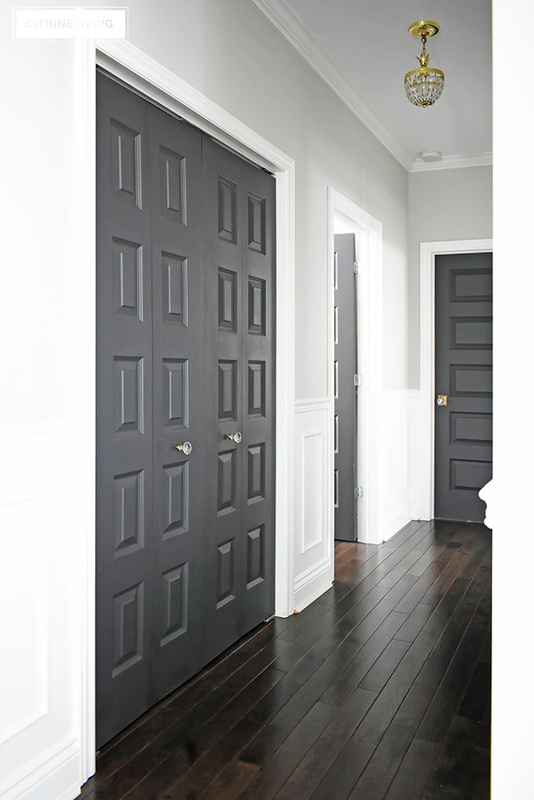 This color is Cracked Pepper by Behr, and is used on all of our interior doors throughout our home. 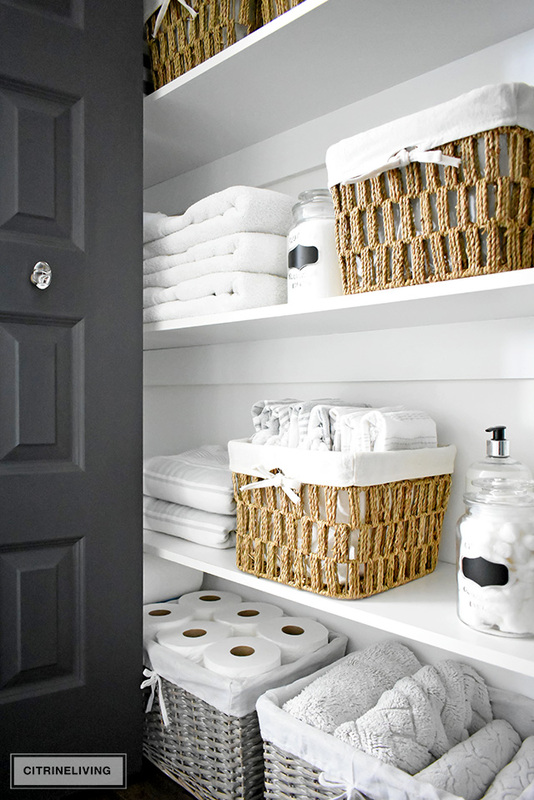 Below are the complete contents of our linen closet. It truly amazes me how much stuff we had ‘stuffed’ in there. Literally. There was so much surplus – sets of sheets, hand towels, old shampoo bottles, expired medicine, you name it. So many items I haven’t actually seen in a few years, or even longer…items I figured we’d use eventually, or that I kept ‘just in case’ I needed it for something. That’s a perfect recipe of accumulating a whole lot of clutter. What I learned, most importantly, is there is absolutely no need to hold onto things like this. I must have had six sets of twin sheets I’ll never use again. Here you can see everything I compiled to either donate, or throw away (that wouldn’t be of use to anyone). 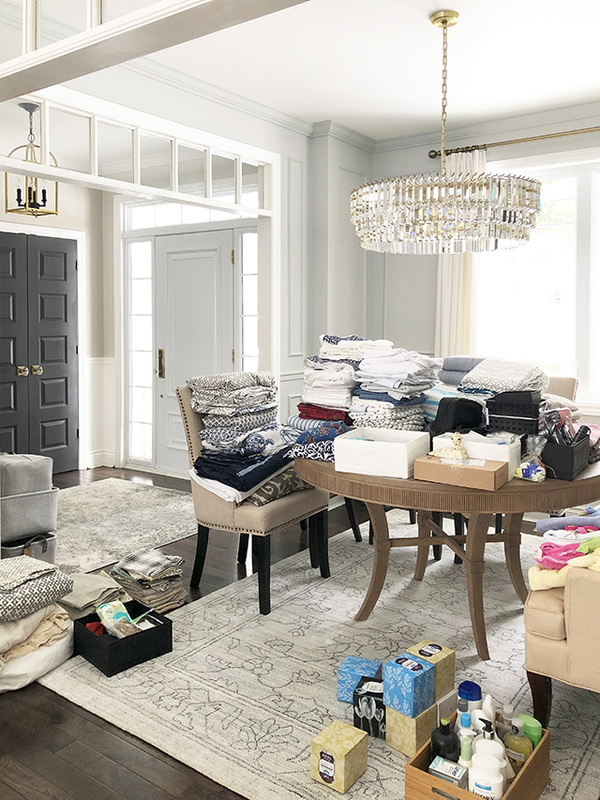 There was so much unnecessary clutter in that closet that was taking up valuable space, and giving me stress every time I opened the door – and I had actually cleaned it out a few years ago! 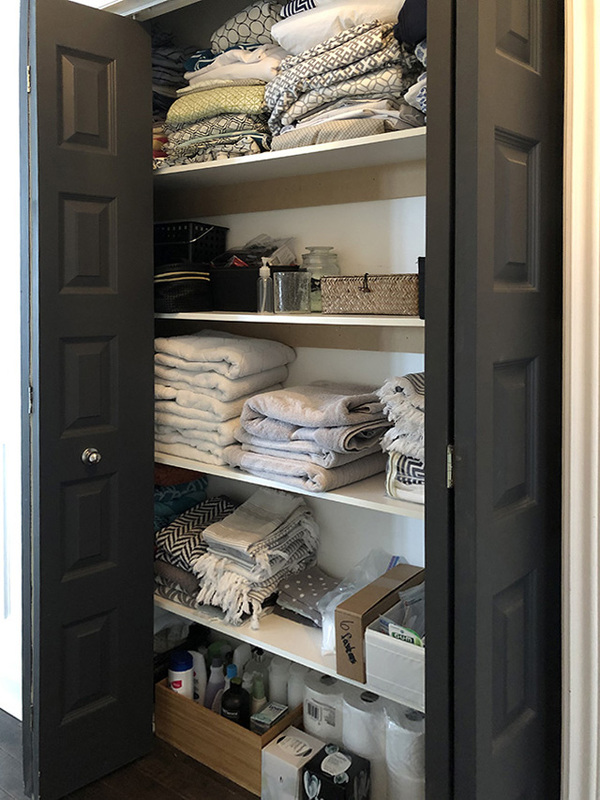 What I love the most about this organized linen closet, is that everything I kept has it’s place and is beautifully stored. 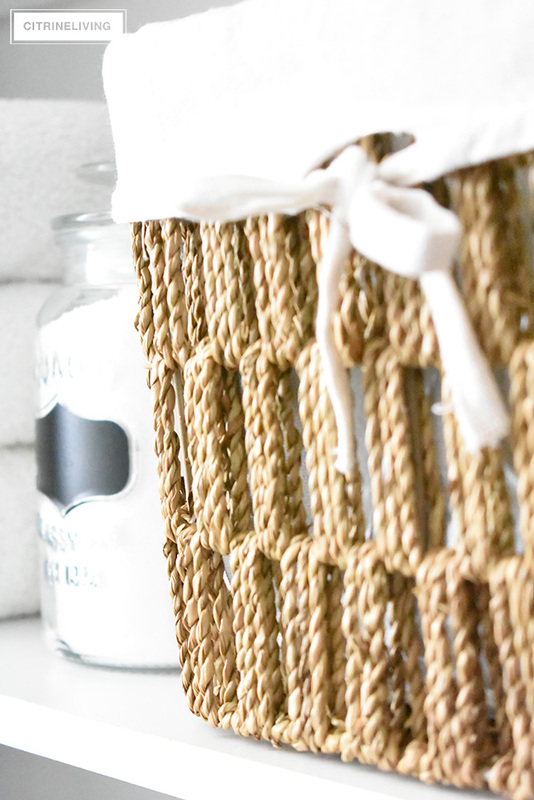 Baskets have become my best friend and the different styles I found work so well together. I knew I wanted a clean and crisp look, but not completely monochromatic… it needed warmth as well. 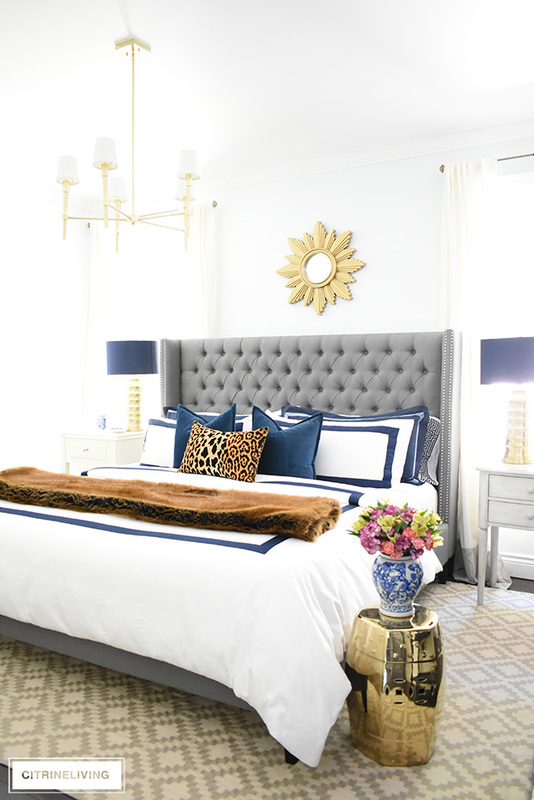 A grey, white and natural color palette is what I settled on to create the look. I’m sharing a lot of photos below, I hope you love this as much as I do! I needed the top shelf and floor to hold the biggest and bulkiest items, like extra sets of bedding and sheets, toilet paper, bath mats, tissue boxes and towels. So I set out to find the biggest baskets this closet could handle. At 11″ deep, it was a challenge, but I was able to find some that fit perfectly at a local retailer (I’m linking similar ones to shop further down!). 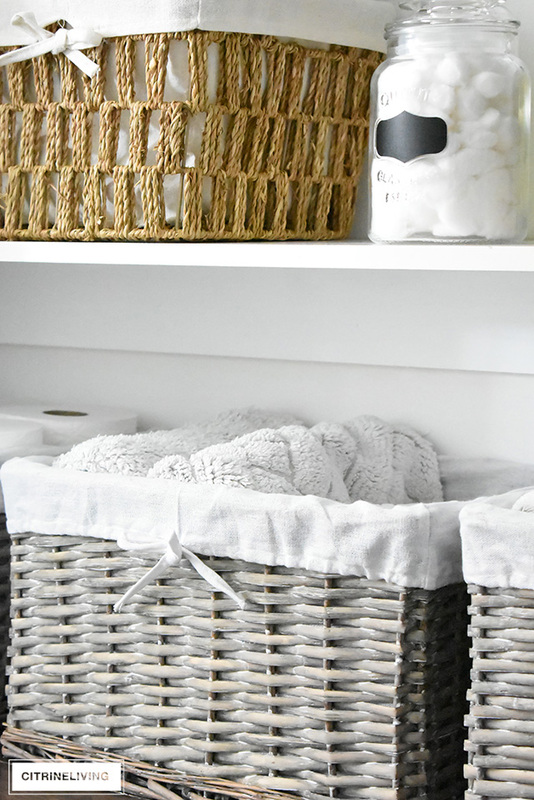 I used fabric baskets on the top shelf for our extra bedding, and the lined wicker baskets on the floor for toilet paper, tissue boxes, towels and bath mats. The second shelf holds all of our medicine (this closet serves double duty since our bathrooms have very limited storage), extra toiletries, bandages, heating pads, and all of those beautifully packaged drug store items that add to that visual noise I was talking about. 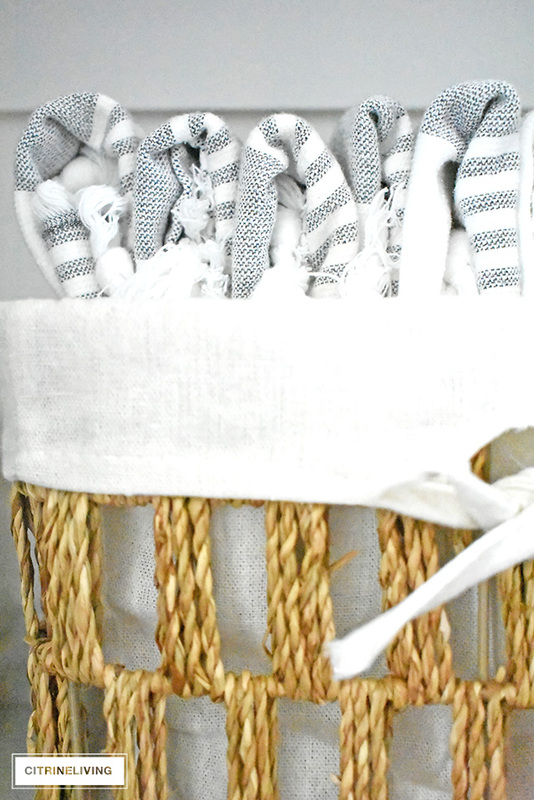 I decided to use these very handy natural woven baskets to conceal all of it. They’re tall enough to hide bottles of peroxide and such, deep enough so you don’t see the contents, and within reach so everything is very easy to find. Our kids are teenagers so there’s no need for labels or keeping things within reach (or out of reach) for small hands. 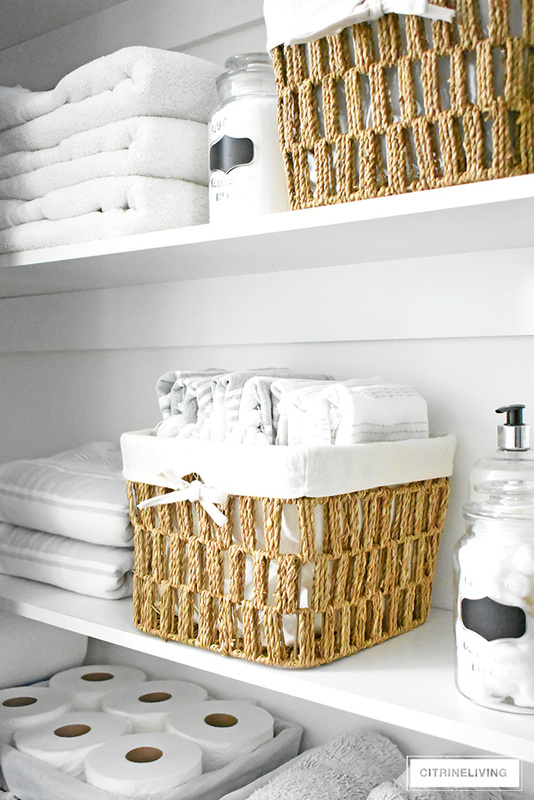 More towels and washcloths are stored in additional baskets and on the shelves as well. 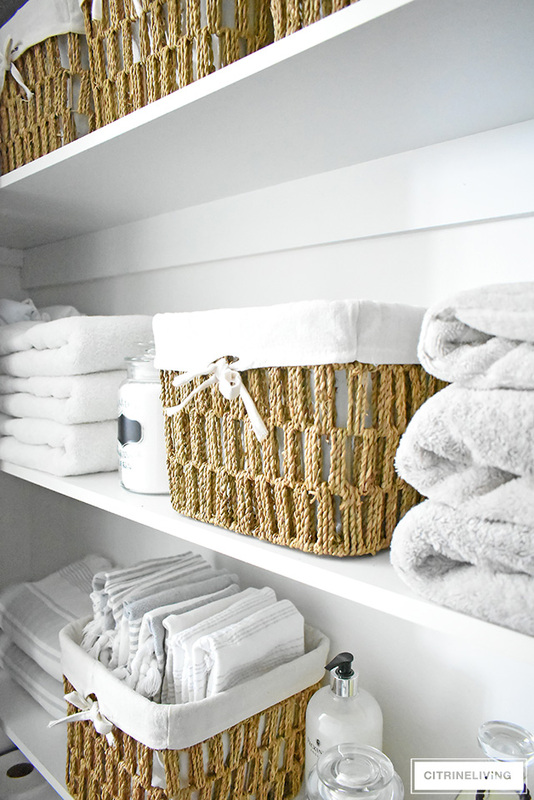 Our bath towels have to sit sideways, because of the shallow depth of the shelves. It used be a challenge to fit everything in here, but now that I’ve purged so much, and gotten rid of so many unneeded things in here, there is a ton of space and it feels like a breath of fresh air. I’ve kept only what we use, what we need, and a few additional items. I even have some extra space in here that’s not being used, that’s how much I was holding on to. 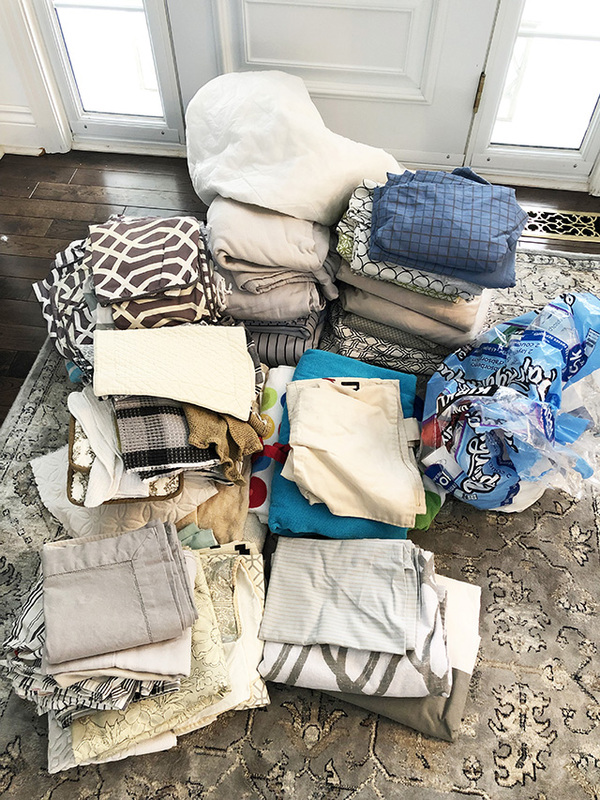 I had so many extra ratty towels and bath mats – the ones that aren’y nice enough to donate to families in need, get used in the garage for rags. The same goes for old sheets. Whatever can’t be given away get’s used for drop cloths – I always need them for painting projects. 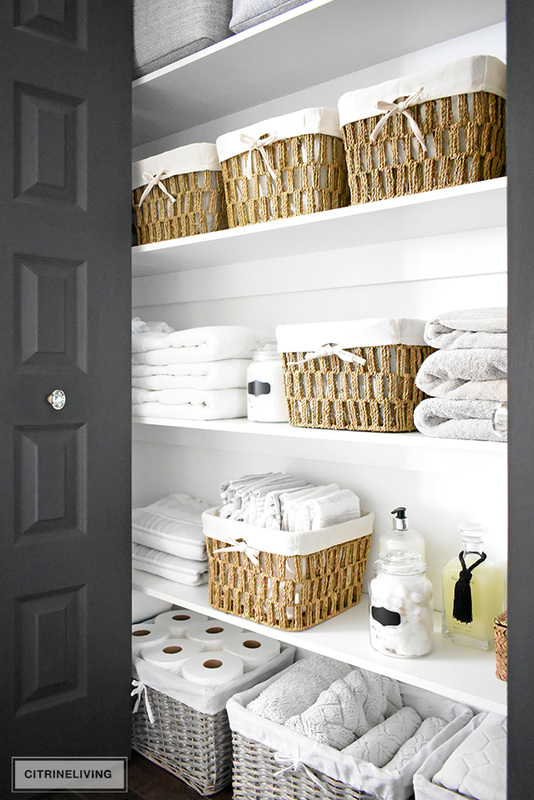 It feels so great to have all of this extra space and such a clean look in this linen closet. 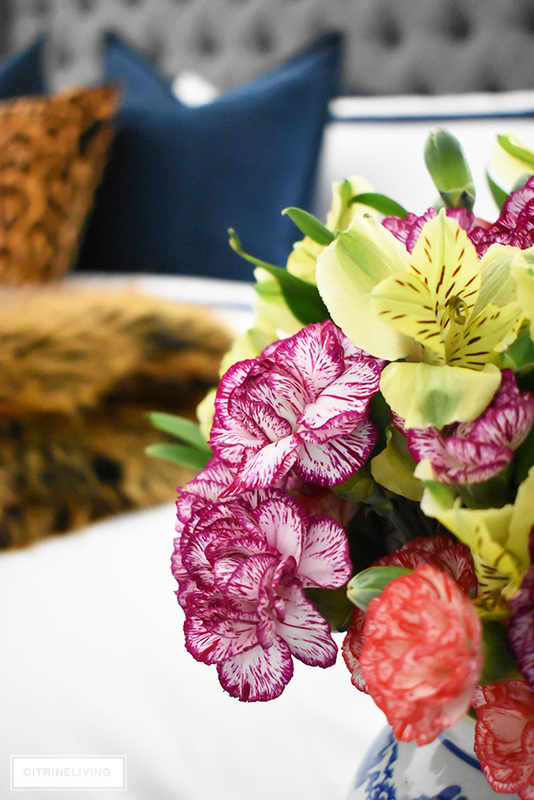 I’ll be honest – I don’t like organizing at all – it’s the reward that I love so much! This project was a lot of work. Cleaning it out, sorting, painting and deciding what to put where afterward, was both physically and mentally tiring. I think it took me about three or four days to complete, but I am so happy I finally got around to getting this done. Nothing feels better than crossing a task off the list! Cute glass apothecary jars from the dollar store (no, I haven’t labeled them yet!) 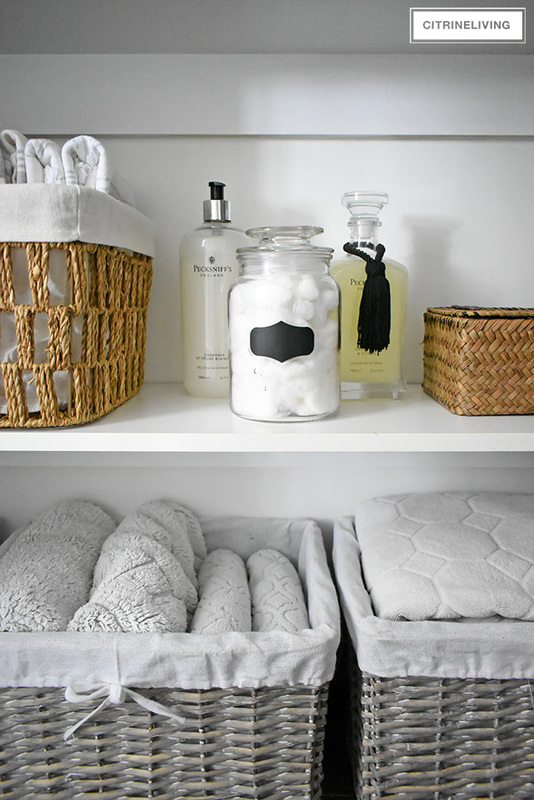 hold bath salts and cotton balls and I love that I have enough room on the shelves now to style them with other beautiful jars. 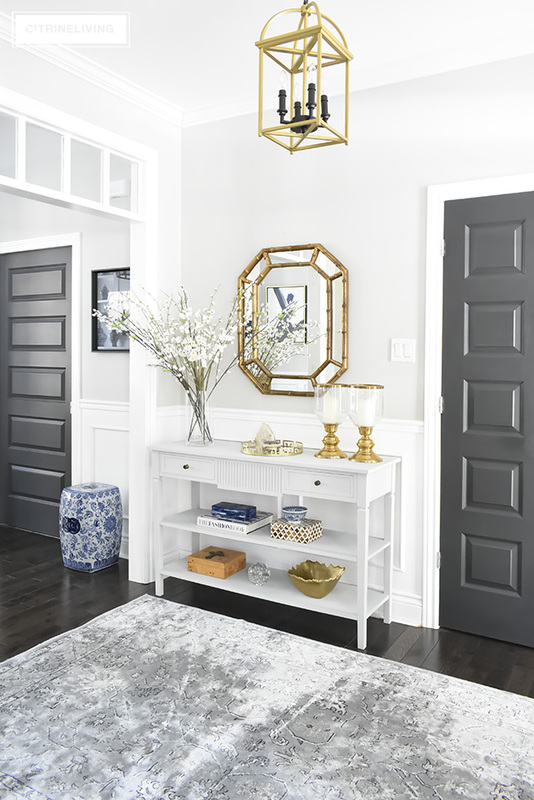 You may recognize some of these from my master bathroom makeover reveal from last year – you can click here to read all about it. KITCHEN PANTRY MAKEOVER REVEAL - ON A SERIOUS BUDGET! Looks amazing!!! Love of course all the baskets, so many good ones!!!!!! I’m a basket fanatic as well. 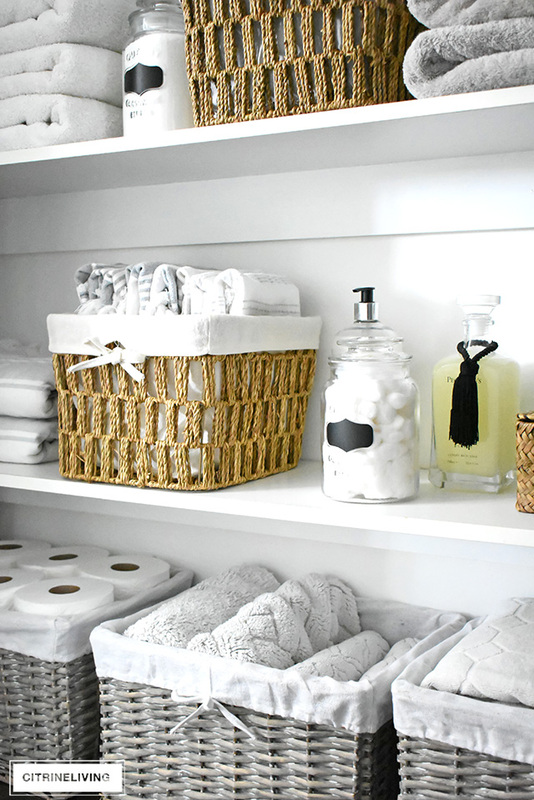 Pillows and baskets are my weakness ;) have a great weekend! I love this Tam! And yes it is “the little things” that bring joy. 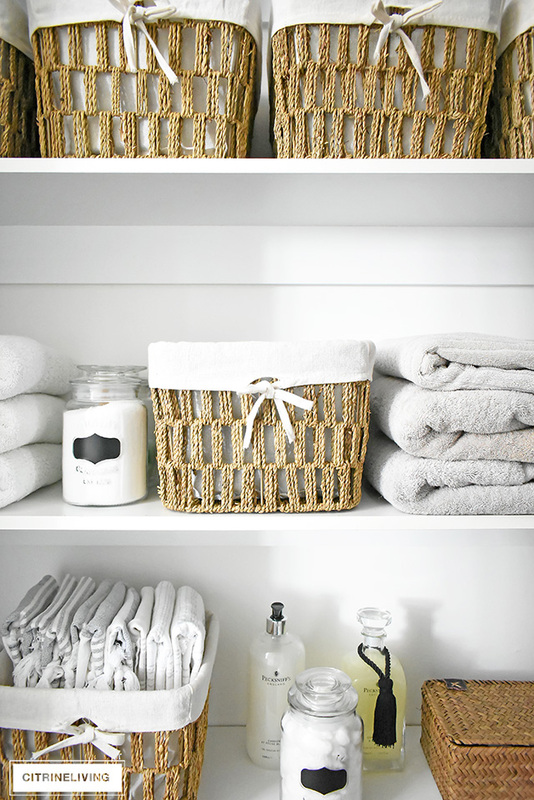 I love how you folded your towells up straight in the baskets. Thanks for sharing! Excellent work! You can also donate clean towels and sheets to an animal shelter, they are always in need of these items for washing animals and making them comfortable. Thank you, so happy you like it! That’s great to know about the animal shelters, I appreciate it! We have a very small and not so deep linen closet and need to do a good purge as well. 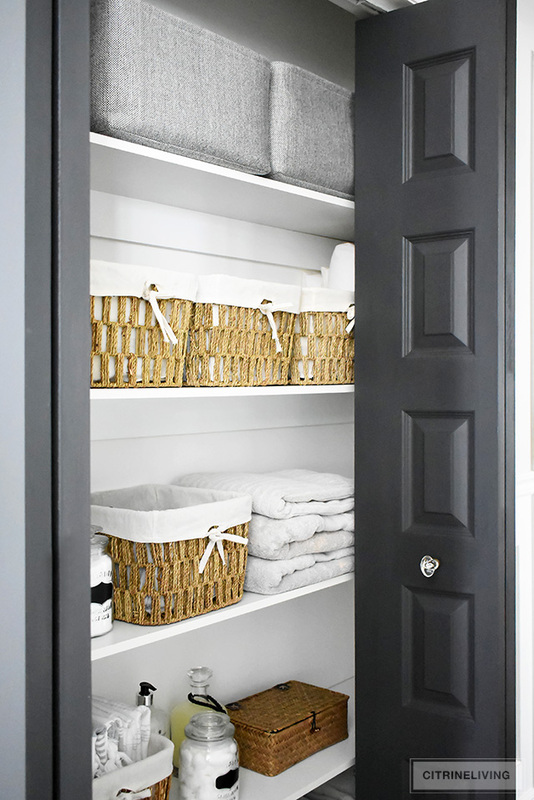 This inspired me to do my linen closet as well as my husbands closet that has to hold our extra towels, toilet paper and Kleenex. 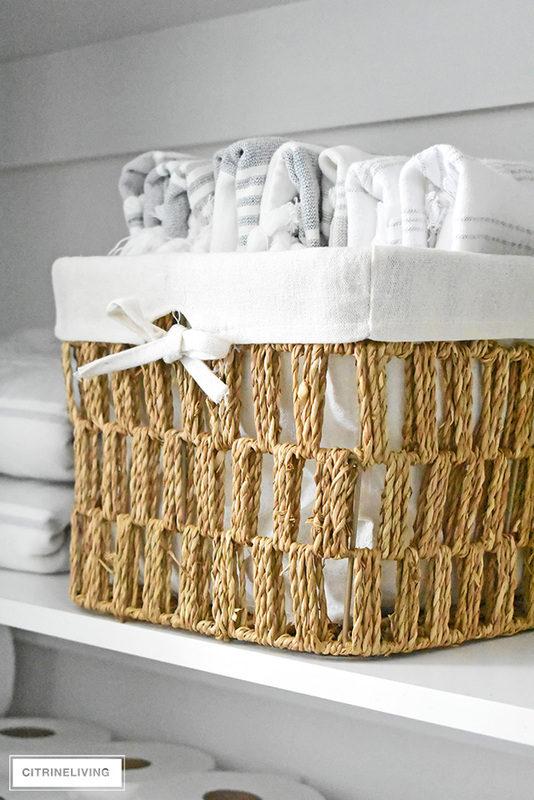 Like the baskets for that will look so much better. Most of your links (baskets) do not work. I tried to look at the fabric and the gray wicker. They don’t work. Thank you very much!! It was a big project to tackle but so worth it! 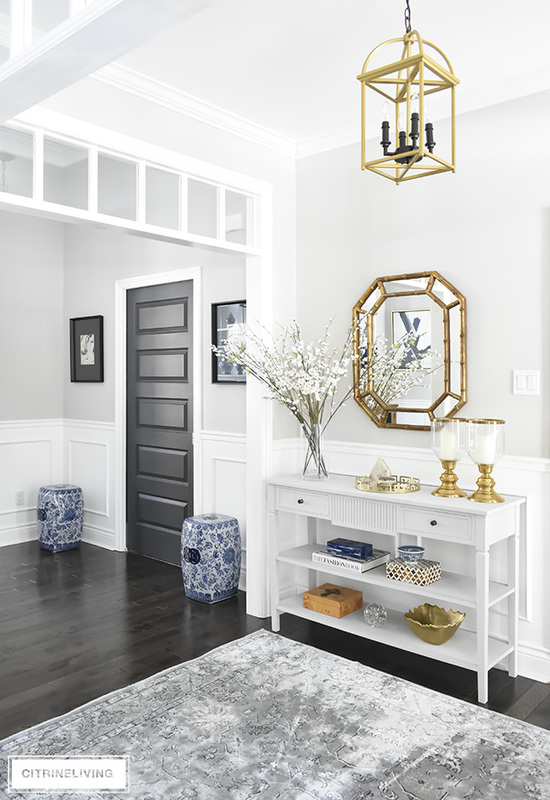 The easiest way to find my rug is under the SHOP tab, SHOP MY INSTAGRAM – you can click on any living room image and it is there. Hope that helps! Thank you so much for sharing this project! 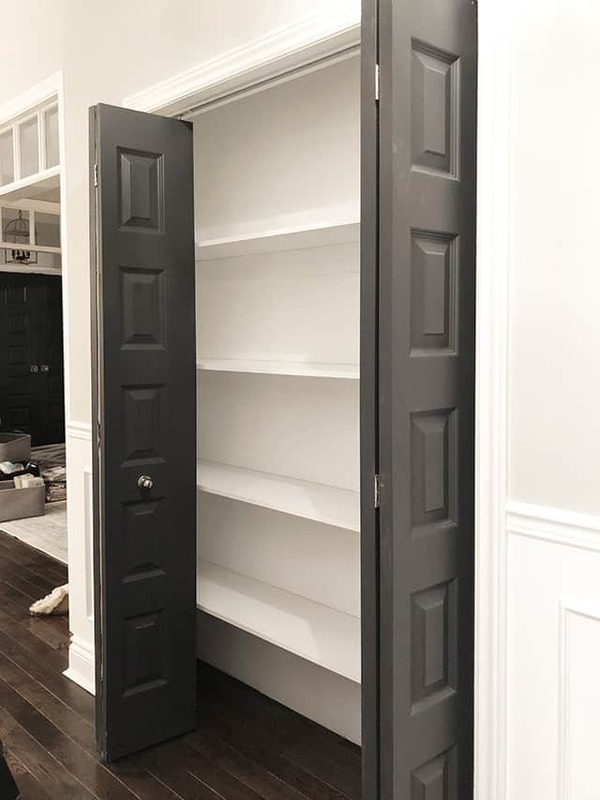 To look at this both functional and beautiful closet is the the best kick for me to open my own crowded closet and s t a r t. I always love watching your posts – they are a spring of energy for me. Thank you! Thanks for the tip, that’s great to know, I had no idea!